Not enough time for all the books you want to enjoy? 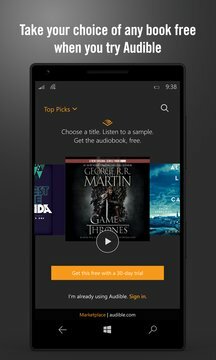 Download the app by Audible, an Amazon company, and access 200,000+ titles including best sellers, classics and everything in between. Immerse yourself in a great story anytime, anywhere, by downloading a great story today. 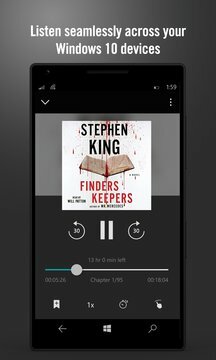 With the Windows 10 Audible app, turn on a good book even when you can’t pick one up—on your way to work, at the gym, while folding laundry, or any other time your eyes and hands are busy.